Who Is Your Chief Experience Officer? Over the past few months, our team has written a lot about the importance of the “customer experience” to organizational success. With increased competition from other provider organizations and health plans, more transparency in performance ratings and rankings, and a shift to value-based reimbursements, providing a positive customer experience for both your payers and consumers is paramount. This requires not only understanding who your customers are and what they want, but also aligning your business practices with what they value (see Consumer Sovereignty As Success Strategy and Another Look At Consumer Sovereignty). So how to do this? Better customer service and a better customer experience. This involves understanding the current customer experience – and developing and managing a plan to improve it. And many health care organizations are finding that to give the customer experience its due, it’s necessary to designate an executive to be responsible for this function – the chief experience officer. As consultant Ingrid C. Lindberg said in, Chief Experience Officers Push Patients To Forefront, “[health plans] put people in charge of costs and they put people in charge of care, but they don’t put anyone in charge of meeting the needs of patients or customers.” Sometimes the act of hiring a CXO can be symbolic in itself – having an executive designated as a CXO sends the message to consumers that their experience is important to the organization (see New Seat in the Hospital C-Suite: The Rise of the Chief Experience Officer). However, contrarians argue that the CXO is merely for show — and the consumer experience should be part of the organization’s entire strategy and the responsibility of all business units. How Can We Deliver A Seamless Primary Care/Behavioral Health Consumer Experience? 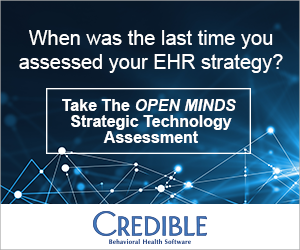 And make sure to join us at The 2016 OPEN MINDS Strategy & Innovation Institute in New Orleans on June 9 for the session featuring Sharon Hicks, OPEN MINDS Senior Associate, Bringing Patient Engagement To Population Health: Engaging Consumers To Improve Outcomes.